Using the EYFS and Montessori curriculum we aim to provide an environment in which all children achieve the best possible education and care and become confident learners with a growing ability to communicate their own views. We aim to ensure that each child is supported in reaching their full potential and is regarded of equal worth, irrespective of age, gender, race or ability. At St Thomas More Montessori Preschool we aim to provide an environment in which all children achieve the best possible education and care and become confident learners with a growing ability to communicate their own views and are supported by the preschool to reach their full potential during the Early Years. Children and young people with SEND have unique learning needs, socially, emotionally, cognitively or physically that make it harder for them to learn than other children and young people of the same age. These children and young people may need extra or different support from that given to others. Please tell us about any additional needs as early on as you can, preferably when your child is registered with the Preschool, so that we can plan appropriate support in advance. Sometimes a child’s needs are not identified until they have started in Preschool. Any concerns raised by staff are promptly shared with the SENCO who may then carry out further observations and assessments. At this point support will be discussed with parents/carers. What will happen if my child is identified as having additional needs? If your child has been identified as needing additional support, the Key Person who works with you and your child and the Preschool SEND coordinator will start to develop a plan with you about your child’s needs and how your child can be supported. This is called a One Plan. A One Plan is person centred and contains information written from the perspective of your child and your family and monitors the support provided for your child to achieve their outcomes. It is used to share information with other practitioners so that you only need to tell your child’s ‘story’ once and practitioners do not duplicate assessments and information. The One Plan will be reviewed regularly so that the support provided continues to meet your child’s needs. That might mean getting advice and further assessment from an outside agency, for example, a Speech and Language Therapist, Paediatrician, Physiotherapist, Occupational Therapist, Area SEND Coordinator or the Specialist Teacher Team. Involving other professionals will help us to support your child in preschool, and will also help you as parents/carers to access information, advice and support as early as possible. When the child’s needs are more complex and outcomes are not being achieved or the child needs a special educational placement or additional support then the One Plan may become an Education, Health and Care Plan (EHCP). The information from the One Plan will be used to make the decision to provide higher needs funding and your child’s One Plan will be converted into an EHC Plan. In this case, a request for a statutory assessment can be made to the Local Authority, for an Education, Health and Care Plan. This can be requested either by parents/carers or by the SENCO. The request is considered by a panel of professionals at the SENAEN office. We monitor how effective our SEN provision is, both for individual children and throughout the preschool, by reviewing each child’s targets and by assessing their progress using the school’s computer software, My Montessori Child. Where appropriate, Education and Health Care professionals will join the termly meetings so that next steps (or targets) can be agreed in a joined up approach. Parent/carers views are central to this process, and you can be as involved in this process as you want to be; some parents/carers chair meetings and plan the agenda, while others choose to be supported in this role. You will receive a draft of the EHC Plan which will give details of your child’s outcomes and how these will be achieved. Moving into primary school is a big step in your child’s life. We work closely with local schools to make the change as smooth as possible. Arrangements begin as early as possible once your child’s school place has been confirmed. During the last few weeks before leaving us, staff from the primary school will visit to meet and observe your child, and to talk to staff. A meeting with parents and staff from St Thomas More Montessori and your child’s new school will be arranged to share the One Plan. 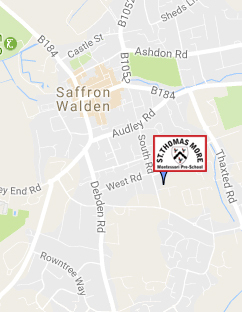 If necessary, additional visits to the school may be arranged, and a child may be supported during some of these visits by a member of staff from St Thomas More Montessori. We monitor and review our policy annually. We ensure the effectiveness of our SEN/disability provision by collecting information from a range of sources e.g. EHCP reviews, staff and management meetings, parental and external agency’s views, inspections and complaints. This information is collated, evaluated and reviewed annually. We provide a complaints procedure. The Local Offer is published as part of the SEND reforms under the Children and Families Act 2014. We very much look forward to working together with you and your child. If you have any questions about additional support for your child, please don’t hesitate to speak to our SEND Coordinator.